Alex Alpharaoh was at the airport with his mother and she could see his nerves. More than three decades earlier, she had brought him from Guatemala to the U.S. as an infant, under extreme duress, just a teenager herself. 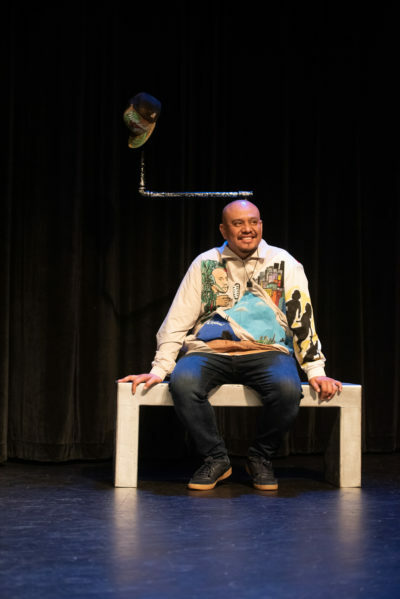 Alpharaoh struggled to build a life as a social worker, father and artist, all made endlessly challenging by the fact that — ironically — he was still the only member of the family who was undocumented. He was deep in the lengthy, expensive, bureaucratic process of securing legal U.S. immigration status and a work permit. In order to comply with work permitting procedures for recipients of DACA, or Deferred Action for Childhood Arrivals, he had to travel to Guatemala, the country of his birth, for three days, fearing that he might not be allowed back inside the U.S. It was on that trip, he says, "I made my God a promise that if I made it back home, I would use everything that I knew how to do ... and put it into telling this story." 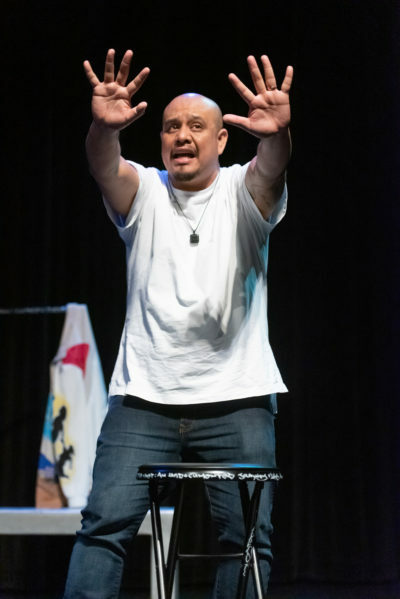 The result is “WET: A DACAmented Journey,” a dynamic solo performance that incorporates three primary narrative voices (“man, mind, and soul”) to tell a multi-layered story about the deeply personal experience of being caught in the crosshairs between family realities, immigration policy and politics. The character referred to as "Alex" in the script is the narrator who addresses the audience directly, relaying the harrowing process of navigating through visa lotteries, fees, documents and Advanced Parole, a bureaucratic process that allows some immigrants to be "paroled" temporarily in the United States. Anner, named for Alpharaoh’s given name, portrays the play’s events in scene, allowing the audience to experience “a lot of the emotional context that happens in the show.” It’s this raw emotional experience around risk and fear that’s been triggering powerful responses from audiences across the nation. A Holocaust survivor approached Alpharaoh after the show one night and, with tears in her eyes, promised to hide him if he needed it, expressing disbelief that she’d lived to see some history repeat itself. Many more who have themselves been undocumented or have had loved ones be deported have recognized themselves in his story. "You're sharing all the same fears that I have," a recent audience member told Alpharaoh. Describing himself as “forever a student” of a culture that brings concise lyrical and musical form to bear on personal narrative and political reality, he cites as influences legends like Gil Scott-Heron and Tupac Shakur. 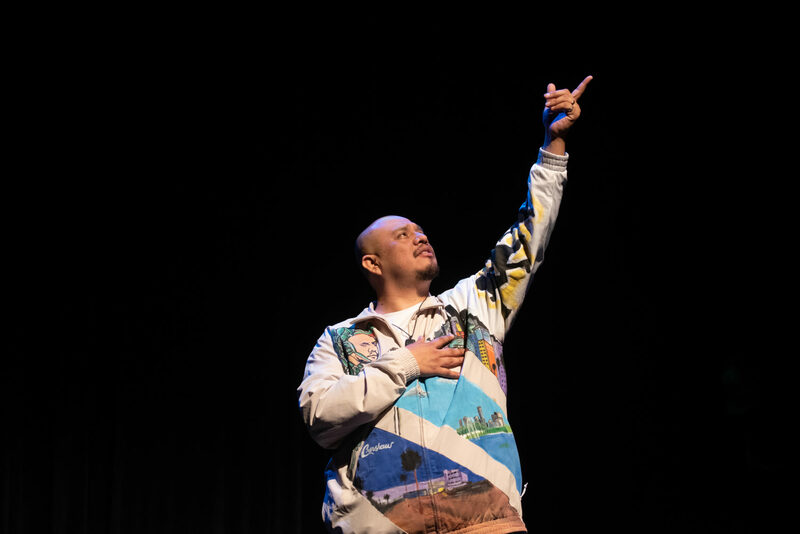 “WET” joins a body of work by solo performers known for bringing hip-hop sensibilities to character-driven stories about the experiences of immigrants and communities of color, including Alpharaoh’s heroes John Leguizamo, Sarah Jones and Roger Guenveur Smith. Paralleling the developing situation of immigration policy and Alpharaoh’s own story, the script itself has continued to evolve. "What's really exciting for me," says the performer, “is that what Boston audiences are going to see is very different from what Los Angeles audiences saw. The national tour version of this show has been completely revised. It's [now more] driven by the characters that help Anner navigate this labyrinth of political policy and the need to go back to a country that he's never known." In the aftermath of recent attacks on a Jewish synagogue in Pittsburgh, the fear of a violent reaction to Alpharaoh’s story within the current national climate is a visceral one for him. He describes a range of emotions around performing: fear, exhilaration, anger, exhaustion. “It’s been difficult,” he says. “My mom can't see the show. She said, 'You're asking me to sit there in that audience and relive some of the most painful experiences in our lives.' "
"WET: A DACAmented Journey" runs from Nov. 8 to Nov. 25 at the Emerson Paramount Center’s Jackie Liebergott Black Box, located at 559 Washington St. in downtown Boston.